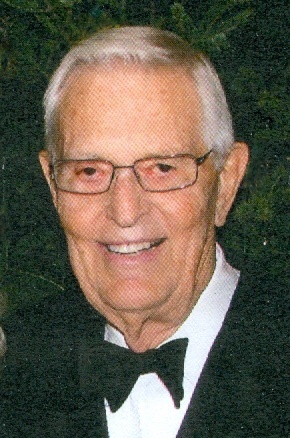 Calvin C. Peterson, 94, of Rock Island, passed away on Tuesday, April 9, 2019 at UnityPoint Health-Trinity, Rock Island. A memorial service will be held at 10:30 am, Monday, May 6, at St. Paul Lutheran Church, Davenport. Visitation will be Sunday, from 3 to 5 pm, at the church. Private burial will be at Rock Island National Cemetery, Arsenal Island, with the Moline American Legion Post No. 246 conducting military honors. Wheelan-Pressly Funeral Home and Crematory, Rock Island, is assisting the family. Calvin C. Peterson was born September 23, 1924 in Pocahontas, IA, of parents Clifton W. and Elsie M. Broderson Peterson. During World War II, USMC Staff Sergeant Cal fought in the Central Pacific Mariana Islands Campaign. He married Carol Louise Johnson on June 8, 1946 at Immanuel Lutheran Church, East Moline. Calvin graduated from Augustana College, Rock Island, in 1948. He worked for John Deere throughout the United States and Europe. In November 1984, after 33 years of service, he retired as Director of Manufacturing at Deere & Company. He was a member of St. Paul Lutheran Church, LSS of Iowa, Augustana College Alumni Association, Iowa Natural Heritage Foundation, Moline American Legion, Moline VFW and Crow Valley Golf Club. Survivors include his sons: Thomas C. Peterson, Waterloo, IA, and Dr. Leland D. Peterson, Moline; daughter in law: Joan Peterson, State College, Penn. ; granddaughter, Dr. Emily A. Peterson (husband, Ben Steward), State College, Penn. ; great grandchildren, Mia Grace Steward and Adrianna Joy Steward; and brother, Cortland Peterson (wife, Velva), Mason City, IA. Calvin was preceded in death by his parents; son, Bruce M Peterson (widowed wife, Joan); and wife, Carol. She died September 21, 2016. Online condolences may be left for the family at wheelanpressly.com. Memorials may be made to St. Paul Lutheran Church or Augustana College. There's still time to send flowers to the Memorial Visitation at the St. Paul Lutheran Church from 3:00 PM to 5:00 PM on May 5, 2019.